The Allied Telesis AT-2911 Series Network Interface Card continues the Allied Telesis tradition of providing reliable fiber adapter cards. 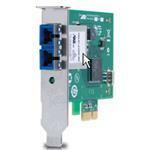 Gigabit cards boost the speed of the network up to ten times a standard Fast Ethernet card to 1000MB per second. The PCIe x1 bus provides the latest technology, enabling the maximum throughput in the smallest form factor possible. Compatible with Windows 7 "Compatible with Windows 7" software and devices carry Microsoftâ? ?s assurance that these products have passed tests for compatibility and reliability with 32-bit and 64-bit Windows 7.